According to a New Tang Dynasty TV Station (NTDTV) report, on June 8, a battle between riot police and more than a thousand local residents in Hohhot, Inner Mongolia, left twenty people injured, with three critically wounded, and three more arrested. In order to secure land to build a Genghis Khan-themed square in a residential district in Hohhot, Inner Mongolia, the Chinese communist regime evicted more than three thousand families from their homes. According to Information Center for Human Rights and Democracy, there are 13,000 families located in the district; most of them are employees of state-owned railway companies. According to local residents, the regime only offers 1,300 yuan (approximately US$168) per square meter for their relocation, far below the market value of 3,500 yuan (approximately US$454) per square meter. According to the Information Center, the conflict began when the riot police and demolition workers started to clear the fences around the district. “The police beat them and twisted their arms until they broke. An old man stood in front of a police car to prevent it from leaving. People demanded justice, but the police didn’t care,” one female local resident told NTDTV. The conflict triggered thousands of locals protested and blocked several highways. It affected at least five highways in the city of Hohhot and caused traffic jam from 12 noon until six in the evening. 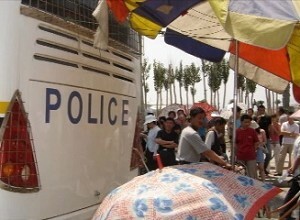 Illegal land seizures have become commonplace in mainland China, but mainland media have been forbidden to report this topic. Please view NTDTV’s video report at NTDTV.com.